Continents L - Teaching level - Learn the names of the continents and oceans. Continents 1 - Beginner level - Click the continent that matches the name at the top. Continents 2 - Intermediate level - Drag each continent or ocean to its correct location. Capitals L - Teaching level - Learn about the Canadian capital cities. Capitals 1 - Beginner level - Pick the correct province or territory for the highlighted capital. Capitals 2 - Intermediate level - Pick the correct capital for the highlighted province or territory. Provinces L - Teaching level - Learn the names of the Canadian provinces and territories. Provinces 1 - Beginner level - Click on the correct province or territory. Provinces 2 - Advanced level - Drag each province or territory onto the map by region. Georegions L - Teaching level - Learn the geographic regions of Canada. Georegions G - Advanced level - Click on the correct geographic region. Rivers L - Teaching level - Learn the rivers of Canada by clicking on them. Visit First Among Equals. Learn more about our Canad's leader - the Prime Minister. Play GeoGame at Discoveryeducation.com and test your knowledge of different countries of the World. GeoSpy. Here's another great way to practice your Geography skills from nationalgeographic.com. Become an Agent-In-Training and earn full GeoSpy status! Canadian Provinces and Territories Card Match Game. Match the province and its shape. 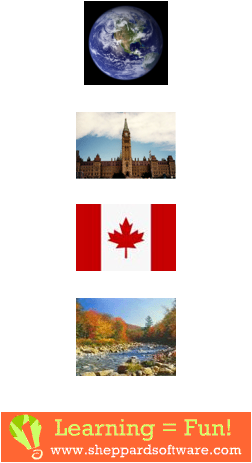 Choose from landmarks, provinces, animals and capitals - then drag and drop the each of the items from the bottom panel onto the right spot in Canada.